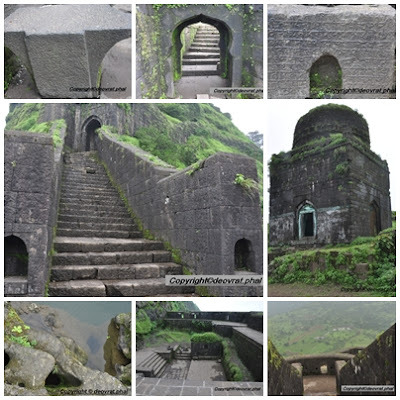 Lohagad is famous for its excellent Fortification, eminent Architecture and its famous 'Vinchukata Machi' aka the fortification like Scorpion's tail & machi in marathi means plateau. Lohagadwadi (Base village) can be directly approached by road or by train from Malavli station, next station from Lonavala. Once you get down at Malavli station there is a road which will take you directly to Lohagadwadi. On the way, there are many sites worth visiting, the prominent among them being Bhaje Caves. 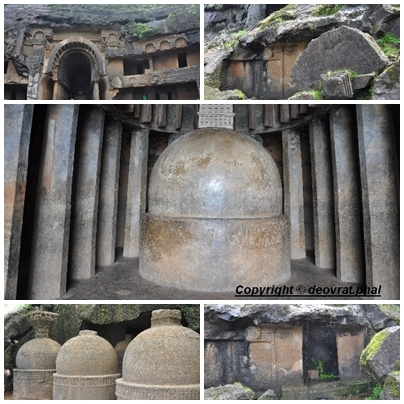 Our first destination was Bhaje caves. A 100 steps climb leads to the first-rate Indian Rock-cut architecture.Bhaje Caves is not far from location of Karla Caves and these are stylistically similar to Karla Caves.Bhaje caves, situated at malavali near Lonavala , pune district are a group of ~22 Buddhist rock-cut caves of First centuary BC located at the foothills of Lohagad-Visapur forts.One can easily notice the catchy features like huge dome shaped prayer hall, 14 stupas & some carvings. Having spent a few minutes in a waterfall nearby we started our trek to Lohagad . Note: No need to get down by the steps again. There is a trail which descends down the slope and takes you to the main road (muddy road) we followed that route and saved a kilometer walk for us !! As mentioned earlier the approach route to this fort is damn simple; just a few 'steps' away from lohagadwadi. Lohagad has a long & stirring history. It was ruled by many dynasties right from Satavahans, Chalukyas, Nizamshahi, Mughals to the Great Maratha King Chhatrapati Shivaji Maharaj. Shivaji Maharaj captured the fort in 1648 right after conquering Torna.Netaji palkar was given the responsibility of looking after the fort. Lakshmi kothi was used to store the treasure raided from surat. In the treaty of purandar 1665, Lohagad was lost to Aurangzeb, under Mirzaraje Jaysingh. Shivaji Maharaj Recaptured this fort in 1670.Aurangzeb recaptured it after Shivaji Maharajs death in 1700 ; and after the peshwas it finally went in hands of Colonel prother. There are four main entrance to the fort namely Narayan darwaza, Ganesh darwaza, Maha darwaza, Triambakeshwar darwaza & Hanuman darwaza, the latter being the oldest of em' all. The main gate is also known as 'Delhi Gate'. All the Darwaza has some notable carvings on it which you can't miss. Carving of lord Hanuman on Hanuman Darwaza is its prominent feature.The Durgah, Octagonal reservoir, few Cannons, other cisterns & panoramic view of Tung-Tikona, Visapur, Pawna Dam add to the list. And regardless of the Rule of the different dynasties, destruction caused by the constant battles, wrekage by the English rulers, the Fort stands Strong, as tough as Iron & deserves the name Lohagad!!! !